Now that we know our 2013 conference agenda, with Toronto coming up in June and Dublin just announced for October, we thought it would be nice to get a snapshot overview of our two host cities. Toronto sits on land purchased by the British from the Mississauga tribe in 1787, although the original city on this spot was called York. In 1834, the city was renamed Toronto and incorporated. Dublin’s roots date back to the 9th century when the Vikings first established a settlement here, and it’s been Ireland’s main city since the 12th century. For a little while in the 18th century, Dublin was one of the largest cities in Europe. The population of the city of Toronto is just over 2.6 million, according to the 2011 Census. The whole urban area is more than 5.1 million. 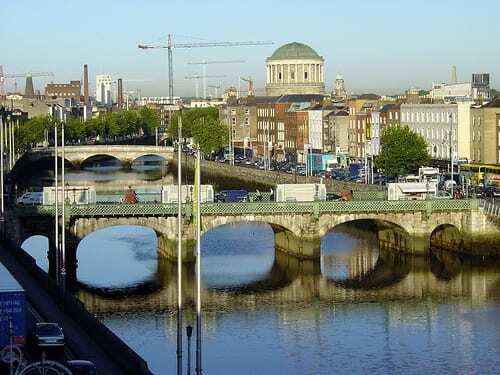 The population of the city of Dublin is a little more than 525,000, according to the 2011 Census. The whole urban area is more than 1.1 million. English is the dominant language in Toronto, but you’ll also hear French (Canada’s second official language), as well as Chinese and Italian (owing to their large populations in the city). English is spoken and understood widely in Dublin, but you’ll also hear plenty of the Irish language, too – it’s the first official language in Ireland. What’s the best airport to use? Toronto Pearson International Airport (YYZ) is Canada’s biggest and busiest airport, and Air Canada’s main hub. Toronto also has a smaller airport, Billy Bishop City Airport (YTZ), with limited passenger flights. It’s actually located on the Toronto Islands right near the city center. Dublin Airport (DUB) is Ireland’s busiest airport and the main hub for Aer Lingus, Ryanair, Aer Arann, and CityJet. In Toronto, there’s a subway and RT (rapid transit), as well as a network of buses and streetcars. In Dublin, there’s a light-rail line called Luas, as well as an intricate network of buses. What do they look like from space? 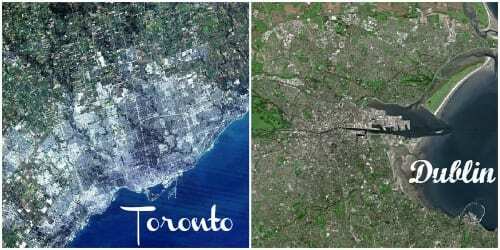 Both cities are on bodies of water – Toronto on Lake Ontario, and Dublin at the mouth of the River Liffey. Both Toronto and Dublin are financial centers for their respective countries. Toronto has long been a publishing powerhouse of a city in Canada, while more recently new media companies like Google, Facebook, Twitter, Amazon, and Microsoft have established European headquarters or major regional bases in Dublin. One of Toronto’s sister cities is Chicago (site of the first TBEX in 2009), and one of Dublin’s sister cities is Barcelona (in the Catalonia region, host of TBEX Europe in 2012). Have you been to Toronto or Dublin? Or both? Tell us what you know – historic trivia, tourist tips, fun facts, or some combination thereof – in the comments below. I love Dublin! I play Irish traditional fiddle so I’ve been a few times – it’s such a friendly city (although the beer is obscenely expensive). It was raining shedloads the last time I was there, but that only made it nicer – a good excuse to tuck in for a good session at the pub. And Trinity College is GORGEOUS – I can’t think of a prettier campus. Very excited for TBEX 2013 in our new home town of Toronto. Hoping everyone who visits loves it as much as we do. Feel free to send us any questions via https://www.facebook.com/KandKadventures or check our out blog for info. Much Travel love! Karin. I have a huge amount of love for both cities! Toronto is my hometown, and it’s such an incredible city with something to offer every visitor (although absolutely everyone should try the King’s Crown Nachos at Sneaky Dee’s). And I went to Dublin for the first time earlier this year, and it warmed my heart. As Kerry mentioned above, I was completely blown away by how friendly everyone was.